Matt Doherty is ready to play in midfield for Ireland in Gibraltar on Saturday if his old club manager Mick McCarthy asks him to do so. 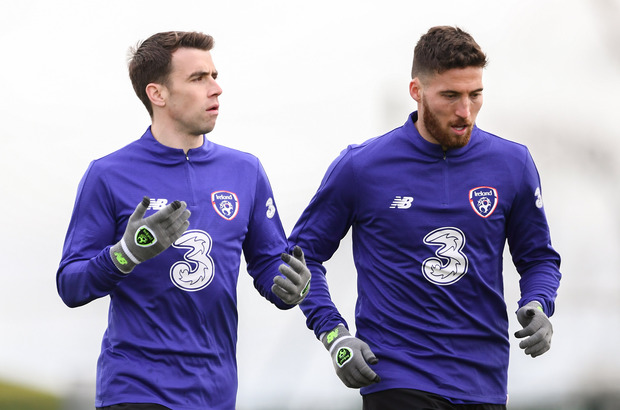 With Callum O'Dowda out injured, there is a vacancy on the right side of the team and slotting the Wolves man in there would solve the issue of getting two quality players in Doherty and skipper Seamus Coleman into the team at the same time. Asked if he could play on the right side of midfield, Doherty had no hesitation in volunteering. "Yes, I play a different position with Wolves at right wing-back, but I can adapt and I'm ready to play wherever Mick asks me." "It's great to be back with Ireland now," gushed Doherty. "Obviously I know Mick and Terry Connor very well from their time at Wolves. It's a new year and a new campaign and I'm looking forward to it. It's been a good season for me at club level too, I've got six goals and seven assists and we're in the semi-final of the FA Cup, we're strong in the Premier League in seventh place. So things are going well. "I'd a great relationship with Mick and TC at the club, and we've picked that up again straight away. All we've been doing so far is playing a few games in training and getting used to what the boss wants. "I'm sure we'll go deeper into the tactics of Mick's plan over the next few days. We need to get off to a good start now, and win these first two games. To slip up against Gibraltar would not be good at all and it will be tough against Georgia who are top-class technically and better than many people think." He admitted that the Wolves players actually expected to beat Manchester United last Saturday night in the semi-final of the FA Cup. "Yes, we did. We've a good team, good players and we're having a cracking season. It was at Molineaux too in front of our own supporters, so we really felt we could win the game, we expected to win it."